The drumless jazz-improv trio (in this case tenor, piano and bass) offers up different possibilities. Without the drums there is a transparency to the musical texture, the bass is exposed in its direct manifestations unmediated by the wash of the ride cymbal and snare-bass-drum punctuations. The bass becomes a third “horn,” so to speak. 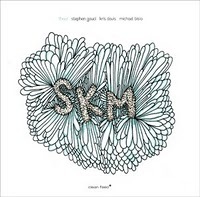 The trio SKM (Stephen Gauci, tenor, Kris Davis, piano, Michael Bisio, acoustic bass) takes advantage of the opportunity in a densely creative self-titled CD just out on Clean Feed (189). It’s modern avant chamber jazz that gives equal weight to all three artists. All the various solo, duo and trio configurations are made good use of. This is serious music. Seriously advanced music. Michael Bisio is his usual inventive self, using all manner of standard and augmented techniques to create a distinctive aural universe. He is a master. (Any reader of this blog has come across my various accolades on his artistry, so I wont repeat them here.) He is shown in especially good light in this project. Steve Gauci sounds terrific on tenor, as he always does, though for this outing he is especially inspired with rapid jabs and asymmetrical phrasing that give the three-way musical dialog a special quality (that Kris and Michael pick up on and give back in equal measure. OK, so the causal arrow can go three ways, but it is natural to hear the tenor as the lead instrumentalist if you listen frequently to this kind of music. Here it is a three-way affair, so suffice to say that his fragments of phrases are a mirroring of, and are mirrored by Kris and Michael’s phrasings.) Steve also strings together some long, complicated-interesting lines when the music goes that way. What is especially ear-grabbing to me is the judicious use of repetition here and there to intensify the particular emphasis at any given point. More than that SKM is improv at its best. The artists make a definitive statement. The CD should be heard by all those wanting to dig the latest in the improvisatory firmament. It makes for exhilarating, absorbing listening.